The scent of ancient perfumes evaporated eons ago, but scientists are able to reconstruct their ingredients by analysis of the residues left on their containers. Up until now, however, such studies have largely been isolated in the scientific literature, disconnected from the textual and archaeological data that place these perfumes back into the hands of their ancient users. 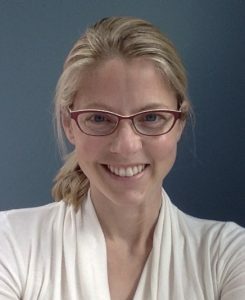 Kate Birney, assistant professor of classical studies, archaeology, and art history, is hoping to change that as co-architect of the OpenARCHEM project, which seeks to assemble the largest set of organic residue samples ever collected from archaeological artifacts around the Mediterranean. Built in collaboration with archaeochemist Andrew Koh of Brandeis University, OpenARCHEM connects botanicals with the containers in which they traveled and the ancient texts that mention them, to reveal the many roles they played in Mediterranean cultures. To develop this project, Birney has received an Andrew W. Mellon Foundation New Directions Fellowship. 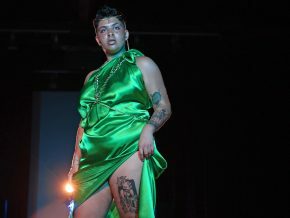 The New Directions Fellowship will enable Birney to take advanced coursework at M.I.T. and to study with experts in mineral analysis and the ecology of the ancient Mediterranean, fields that are essential for understanding the cross-disciplinary nature of this work. 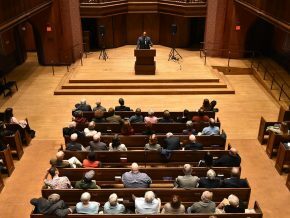 On March 28, the Archaeology Program and the Department of Classical Studies invited Ian Roy of Brandeis University to Wesleyan to discuss ways new technologies are used to study the past. Roy is the founding head of Brandeis MakerLab and director for research technology and innovation at Brandeis University’s library. Students learned how to use a portable Artec 3-D scanner to scan a vessel from the Wesleyan University Archaeology and Anthropology Collections. Roy first visited the Archaeometry: How to Science the Heck out of Archaeology class taught by Andrew Koh, visiting assistant professor of archaeology. There, he demonstrated how to scan objects in 3-D using an Artec Space Spyder, a tool that uses structured light to capture incredibly high-resolution scans of objects. 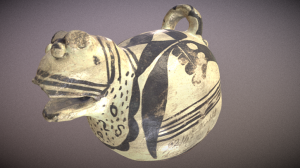 The class produced multiple models of artifacts, including a vessel that has since been posted to Sketchfab. 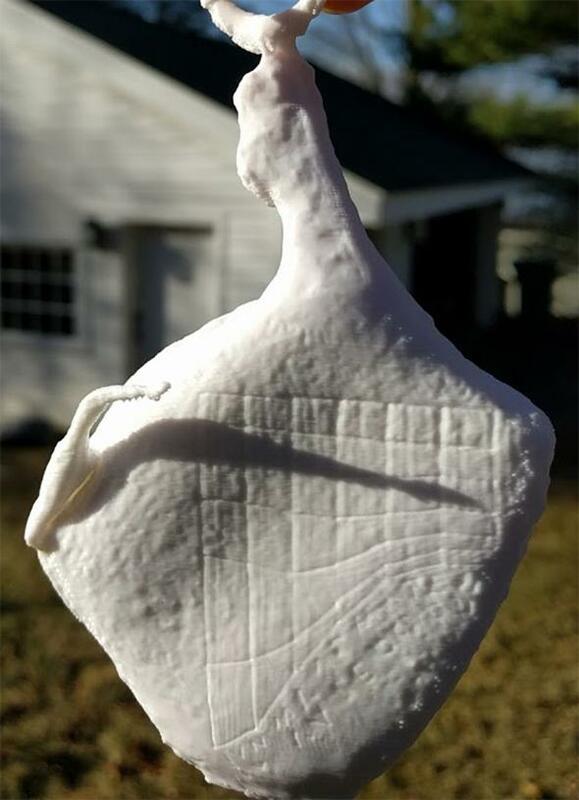 “What’s so amazing is that these are just quick versions made in only 15 minutes, without any post-processing and touch-ups,” said Kate Birney, assistant professor of classical studies, archaeology, and art history. Christopher Weaver MALS ’75, CAS ’76, the Distinguished Professor of Computational Media in the College of Integrative Sciences, is profiled. Gabriel Snashall ’21 discusses his path from serving as a cryptographic communications supervisor aboard the USS Pittsburgh to studying at Wesleyan through the Posse Veteran Scholars program. He plans to pursue a career in bioethics law. 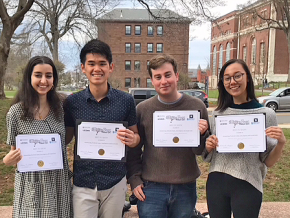 Four Class of 2017 graduates who completed the service-learning course “Decolonizing Indigenous Middletown: Native Histories of the Wangunk Indian People,” are co-authors of articles published in the Bulletin of the Archaeological Society of Connecticut. Amy Bloom ’75, the Shapiro-Silverberg Professor of Creative Writing, will discuss her new book, White Houses, at several public events around Connecticut this month. The duo who began playing together as MGMT when they were Wesleyan undergraduates, Andrew Van Wyngarden ’05 and Ben Goldwasser ’05, released a new album to favorable reviews: “MGMT are back to their roots on Little Dark Age, with concise tunes built from cushy keyboard beats and cute, kiting melodies,” wrote Jon Dolan in Rolling Stone. Matthew Lerner ’03, an assistant professor of psychology, psychiatry and pediatrics in the department of psychology at Stony Brook University is part of a team—with scientists from Vanderbilt and University of Alabama at Tuscaloosa—that received $3 million in funding from the National Institutes of Mental Health to study how participation in a theater production can help people with autism spectrum disorders. “The process of putting on a play with others and being able to successfully produce and perform that has key benefits to learn and practice,” said Lerner. Craig Thomas ’97 and Carter Bays ’97 recall the 100-day battle between the Writers Guild of America and the Alliance of Motion Picture and Television Producers when their creation, “How I Met Your Mother,” was in only its third season and all filming was to be done without any writers on the set. 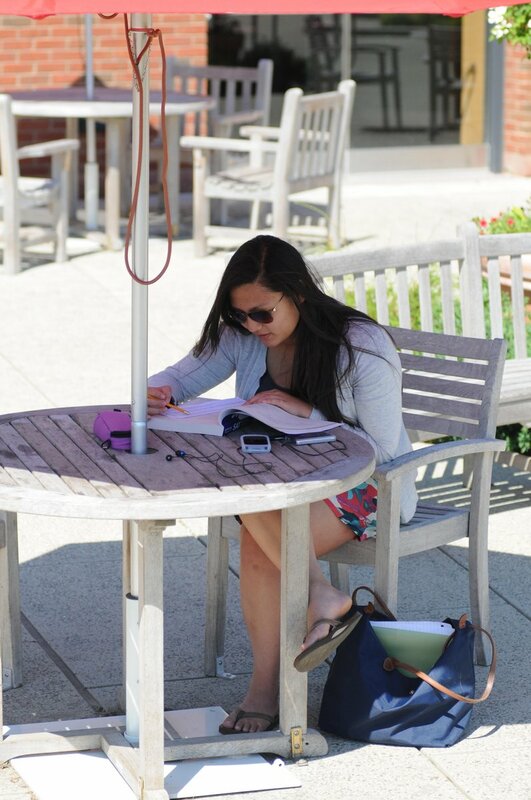 Scattered throughout campus are remnants of not only Wesleyan’s history, but world history. After the closing of the Wesleyan Museum in 1957, thousands of specimens in many collections were displaced, often haphazardly, to nooks, crannies, tunnels, attics, storage rooms, and random cabinets at Exley Science Center, Judd Hall, and the Butterfield and Foss Hill residence complexes. 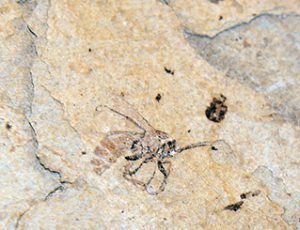 A fossilized bee was discovered in the fossil collections. Many of these specimens haven’t been accessed in 60 years. This summer, Thomas, along with two student research fellows, began the painstaking process of not only locating and organizing collections, but digitally cataloging their finds. 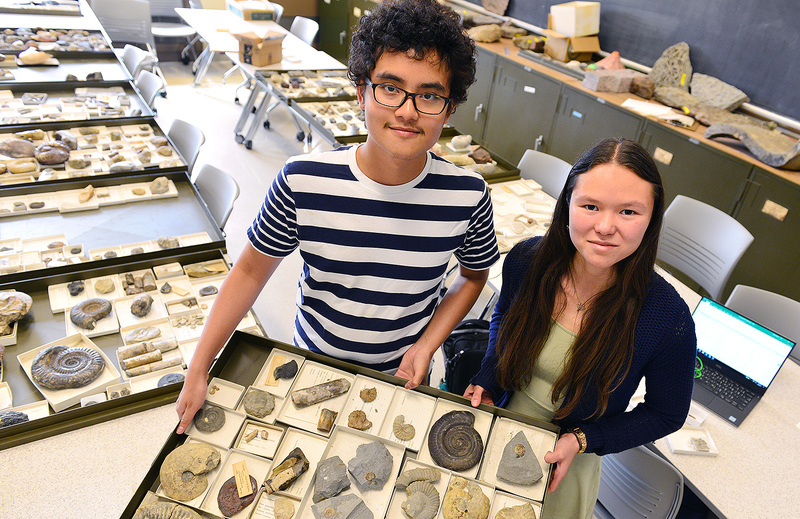 Sajirat Palakarn ’20 and earth and environmental science graduate student Melissa McKee ’17 work 40 hours a week on the project and have created a “fossil assembly line” in Exley Room 309. 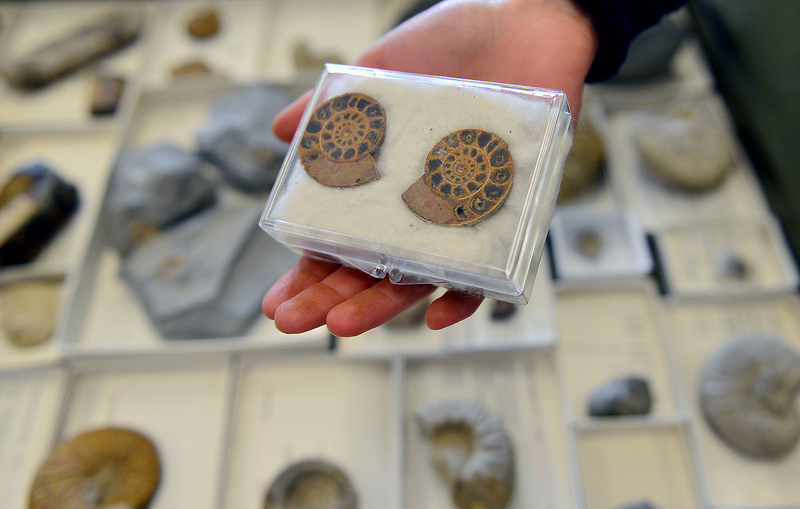 The students take turns sorting trays of fossils by class and phylum, and then match the fossils with identifying hand-written cards or books from an archaic card catalog, entering the information, piece by piece, into a spreadsheet. They’re expecting to itemize more than 15,000 fossils this summer. Melissa McKee holds a plant fossil from Greenland, collected during the second relief expedition for a Peary Arctic Expedition. The leaves were then thought be by Miocene (~20 millions years old), but now they’ve been identified as being much older at ~ 60 million years. So far, the students have discovered dozens of fish fossils from the Jurassic Period (99.6 to 145.5 million years ago) and Triassic Period (251 million and 199 million years ago). 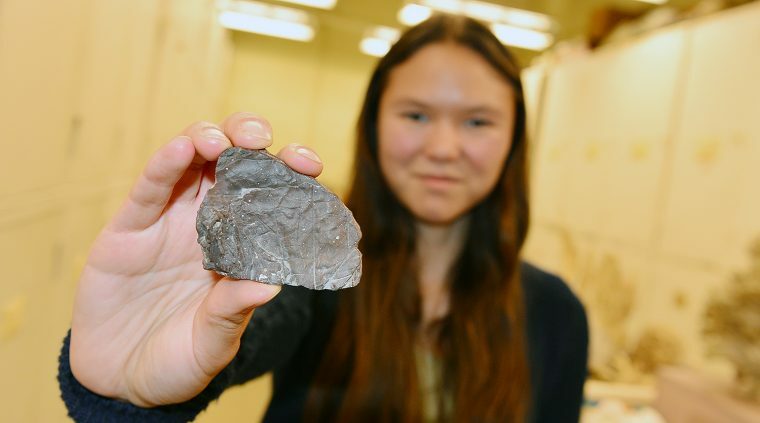 They’ve encountered fossils of preserved leaves and insects from what is today Utah, Wyoming and Colorado, dating back to the Eocene Period, when the world was much warmer (40-45 million years ago). They’ve also found fossilized plants from coal deposits in Illinois (about 300 million years old), as well as fossil sea lilies (crinoids), which lived in shallow warm seas in what is now Indiana. Many of these fossils were collected by S. Ward Loper, who was curator of the Wesleyan Museum from 1894 to his death in 1910. They’ve even discovered a plant fossil from Greenland, donated to the Wesleyan Museum in 1895 by A.N. Varse, who was on the second relief expedition attempting to assist Robert Peary on one of his early expeditions to explore Greenland and reach the North Pole. 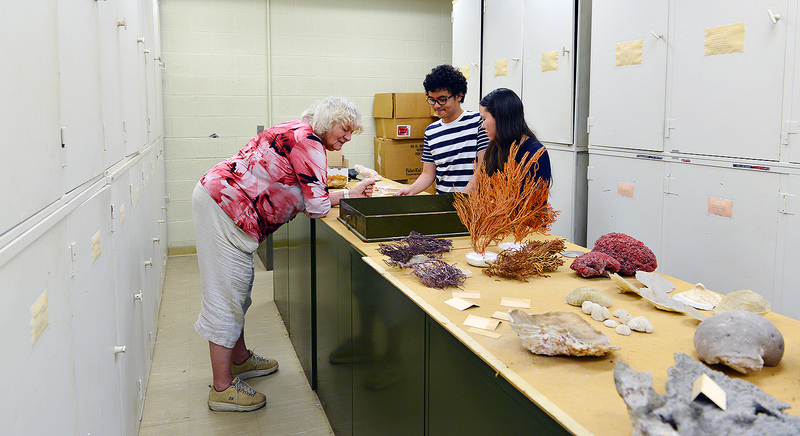 While most of the fossil finds are located in locked drawers in the hallways of Exley Science Center, the students also are cataloging fossils in the Joe Webb Peoples Fossil Collection, located on the fourth floor. The museum is named after the late Professor Joe Webb Peoples, who was chair of the Department of Geology from 1935 until his retirement in 1975. The students not only catalog the artifacts, but they also write about their finds, and the museum, on a blog and on Twitter. McKee and Palakarn, a College of Social Studies major, are constantly learning on the job. “I don’t have a science background, but here I am learning about unicellular microorganisms, sponges, coral, arthropods, trilobites and sea urchins,” Palakarn said. Sajirat “Bright” Palakarn ’20; Research Professor Ellen Thomas; and graduate student Melissa McKee ’17 hold fish fossils inside the Joe Webb Peoples’ Fossil Collection in Exley. 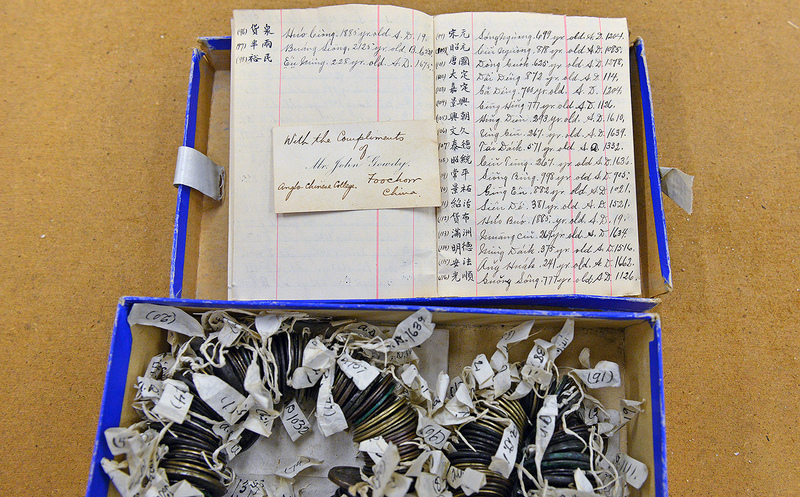 While rummaging through drawers in Exley’s Specimen Storage room, Ellen Thomas discovered large collections of old coins including miniature intaglios and ancient Chinese coins collected by the Methodist missionaries who started Wesleyan. The coins are documented in an accompanying booklet. Melissa McKee holds polished halves of a cephalopod found in Madagascar. This species lived during the late Jurassic Period. 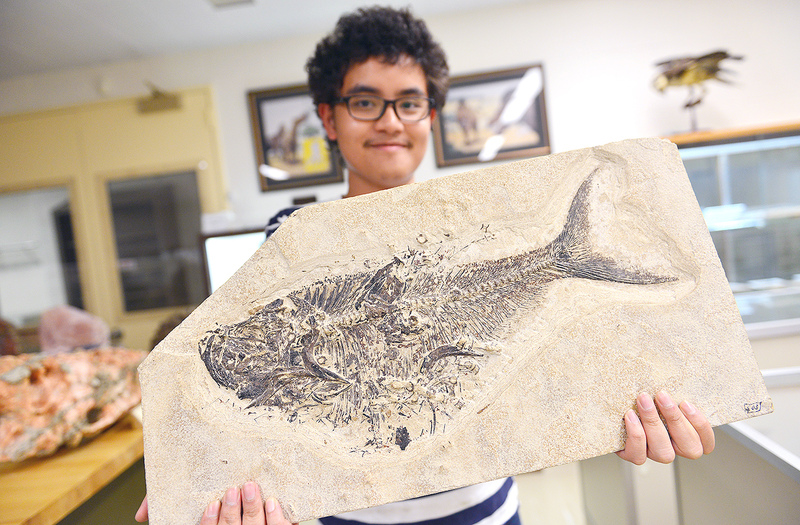 Sajirat Palakarn displays a fossil of Diplomystus dentatus from the Eocene Period. The fossil was discovered in what is now Wyoming. Diplomystus is an extinct freshwater fish distantly related to herrings and sardines. The students transcribe hand-written records into electronic form. Pictured is the record of A.N. Varse’s fossil discovery in 1894. It was donated to Wesleyan in 1895. The research team also found dozens of coral samples stashed above these cabinets in Exley Science Center. “Some of these are now extinct. We will want to catalog these too, but this will be a project for another time,” Thomas said. Assistant professor Kate Birney (pictured in foreground wearing a blue shirt and tan hat) and Joy Feinberg ’19 (pictured in back with a long-sleeve shirt) work to unearth skeletons and artifacts buried in a Philistine cemetery. Two Wesleyan students, one recent alumna and a faculty member contributed to a groundbreaking discovery of the first Philistine cemetery, a crowning achievement of more than 30 years of excavation in Ashkelon, Israel. 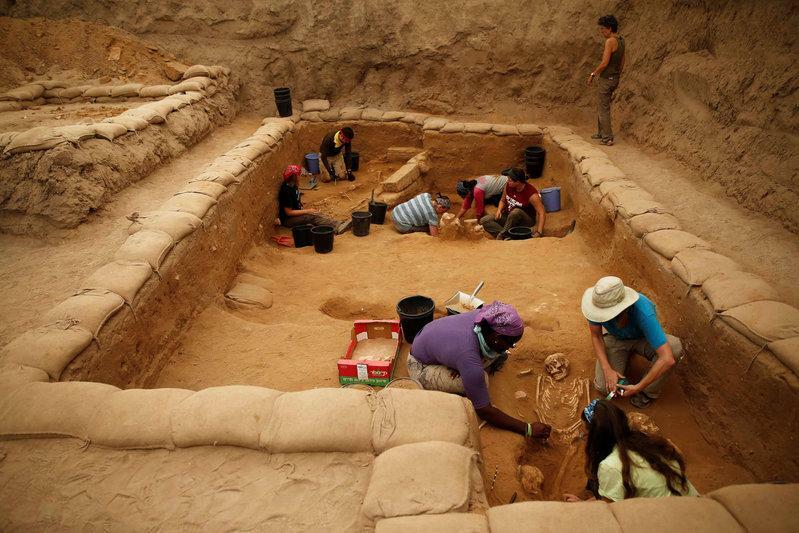 Archaeologists and scholars have long searched for the origin of the Philistines, and the discovery of the cemetery is poised to offer the key to this mystery. Findings from the cemetery, dated to the 11th–8th centuries BCE, may well support the claim – long inferred and recorded in the Bible – that the Philistines were migrants to the shores of ancient Israel who arrived from lands to the West around the 12th century BCE. 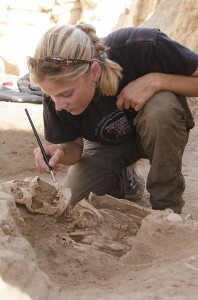 Kate Birney, assistant professor of classical studies, assistant professor of archaeology, assistant professor of art history, is the assistant director of the Leon Levy Expedition to Ashkelon and has been bringing Wesleyan students to the site since 2011 to participate in the research and excavation. The 3,000-year-old site, located in the southern district of Israel on the Mediterranean coast, offers clues to the Philistines’ way of life. Little is known about their origins. 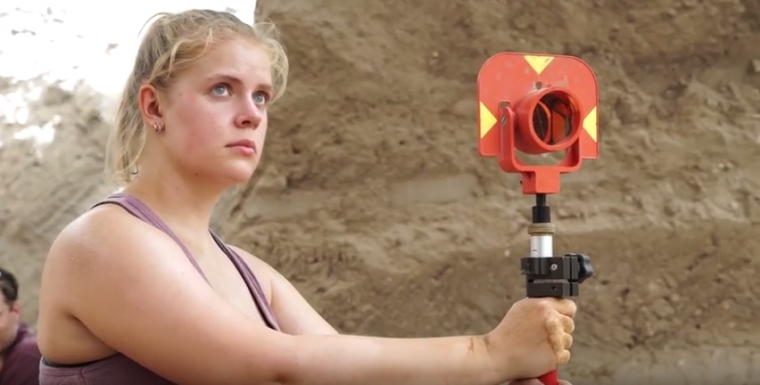 Sarah McCully ’16 has worked for the Leon Levy Expedition in Ashkelon for three years. This summer, Joy Feinberg ’19, Jaimie Marvin ’19 and Sarah McCully ’16 worked on the Philistine cemetery. McCully ’16, who came to Ashkelon with Birney years ago, is now a staff member for the Leon Levy Expedition. In addition, Sam Ingbar ’16, Hannah Thompson ’17, Maria Ma ’17 and Sabrina Rueber ’18 are also in Ashkelon this summer working on the excavation of a 7th century merchants’ neighborhood. At right, Ying Jia Tan, assistant professor of history, taught his class, History of Science and Technology in Modern China, in Wesleyan’s Anthropology and Archaeology Collections. The class’s reading correlated with artifacts displayed in the collections. Pictured at left is Jessie Cohen, lab manager. 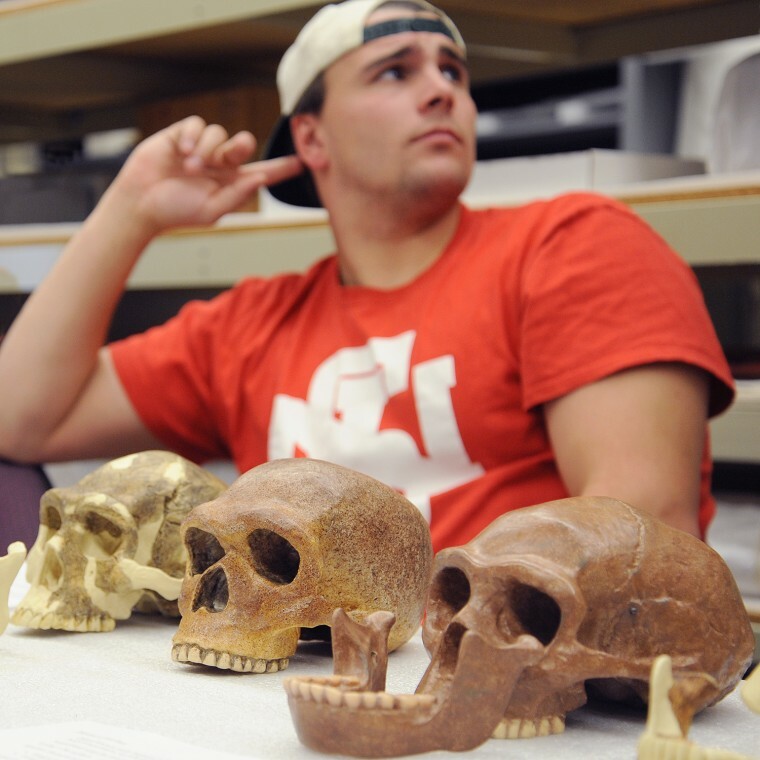 TJ Blackburn ’16 listens to a classroom discussion while examining skulls from three different time periods. In the 1920s, a team of scientists working in the Zhoukoudian cave system in Beijing, China unearthed Peking Man, a roughly 700,000 year-old sample of Homo erectus. After the communist revolution of 1949, Peking Man became a prominent figure in bringing science and the story of human evolution to the masses. As part of the required reading for the HIST 368 class, History of Science and Technology in Modern China, Ying Jia Tan, assistant professor of history, is having his students read The People’s Peking Man, written by Wesleyan alumna Sigrid Schmalzer ’94. The People’s Peking Man offers a skilled social history of 20th century Chinese paleoanthropology and a compelling cultural history of assumptions and debates about what it means to be human. 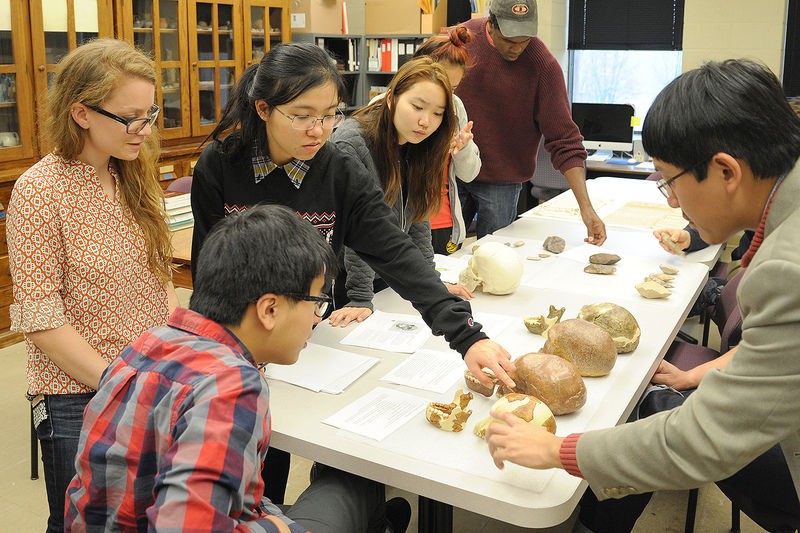 On Nov. 11, Tan brought his students to the Wesleyan University Anthropology and Archaeology Collections (WUAAC) to offer them a tangible and hands-on lesson to complement their reading. 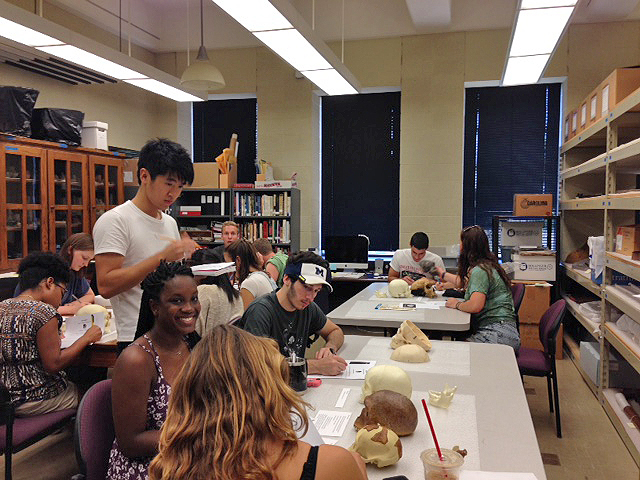 Jessie Cohen, lab manager, prepared for the class by displaying fossil and extant replicas including Australopithecus afarensis (“Lucy”), Homo erectus (“Peking Man” and “Java Man”), and Homo sapiens. She also included several stone tools which originate from the Paleolithic era, a prehistoric period in human history that lasted approximately 2.5 million years. These particular stone tools are associated with specific dates and locations that overlap with Homo erectus production and usage. “The juxtaposition of these widely ranging fossil replicas, modern Homo sapiens, and stone tools is representative of the changing environment, physical demands, and technological advances noted throughout human evolution,” Cohen explained. She also displayed a Chinese newspaper / Chinese-American school brochure came to the collection by way of missionaries in the early 1900s. 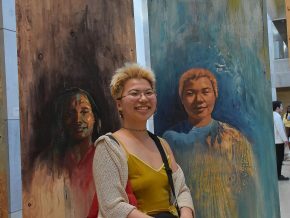 “I thought it would be a great idea for the students to see the replicas of Peking Man and think about how the Peking Man was constructed by anthropologists,” Tan said. On Oct. 5, Phillip Wagoner, professor of art history, professor of archaeology, was named a co-recipient of the American Historical Association’s John F. Richards Prize in South Asian History. The John F. Richards Prize recognizes the most distinguished work of scholarship on South Asian history published in English. Eligibility includes books on any period or field of South Asian historical studies and works which integrate South Asian history with broader global issues and movements. Wagoner shares the prize with Richard Eaton of the University of Arizona. 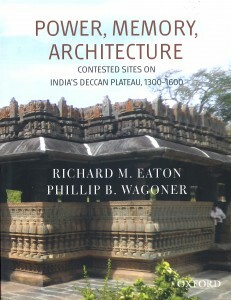 Together, they co-authored the book, Power, Memory, Architecture: Contested Sites on India’s Deccan Plateau, 1300–1600, published by Oxford University Press in March 2014. In this book, Wagoner and Eaton examine the political histories and material culture of smaller, fortified strongholds both on the plains and atop hills, the control of which was repeatedly contested by rival primary centers on the Deccan Plateau. Exceptionally high levels of conflict over such secondary centers occurred between 1300 and 1600, and especially during the turbulent 16th century when gunpowder technology had become widespread in the region. Many people think of archaeology as taking place in exotic locations overseas, not in their own backyard. Yet archaeology projects are continuously being carried out all over the state of Connecticut. On Oct. 18, Wesleyan’s Archaeology Program and Office of Community Partnerships will present the Connecticut State Archaeology Fair to give the public a close-up look at some of these projects. Part of Archaeology Awareness Month in October, the fair will feature many hands-on exhibits and activities for adults and kids. 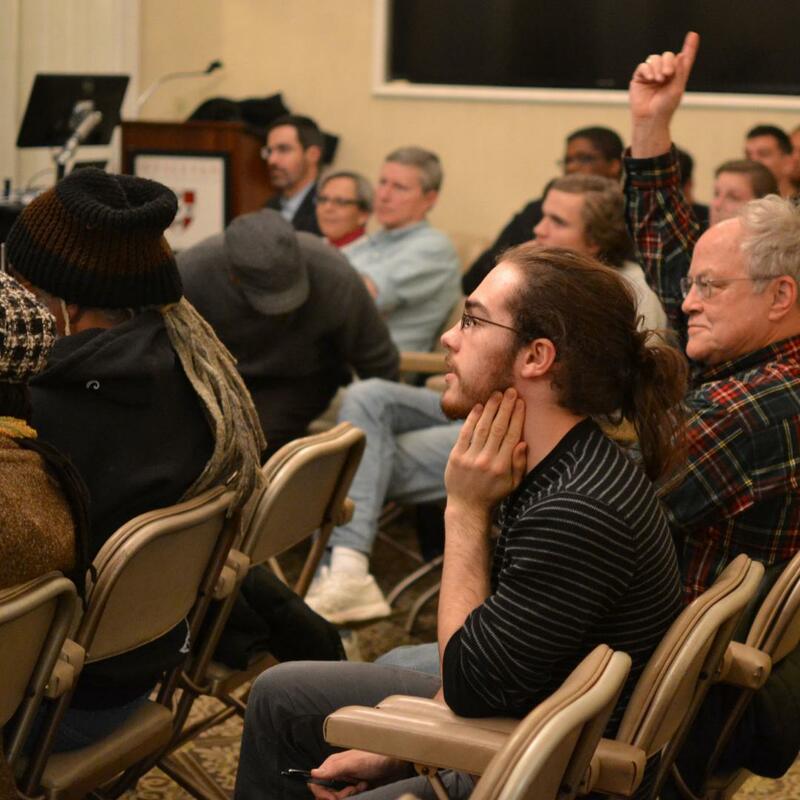 Presenters will represent a full spectrum of archaeology in the state, ranging from local tribes and community groups to educational institutions and commercial businesses. 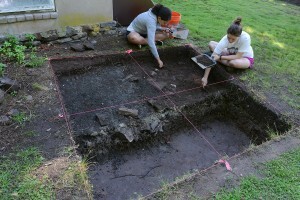 Wesleyan students dig for artifacts at the “Beman Triangle” near campus. Book co-authored by Phillip Wagoner. 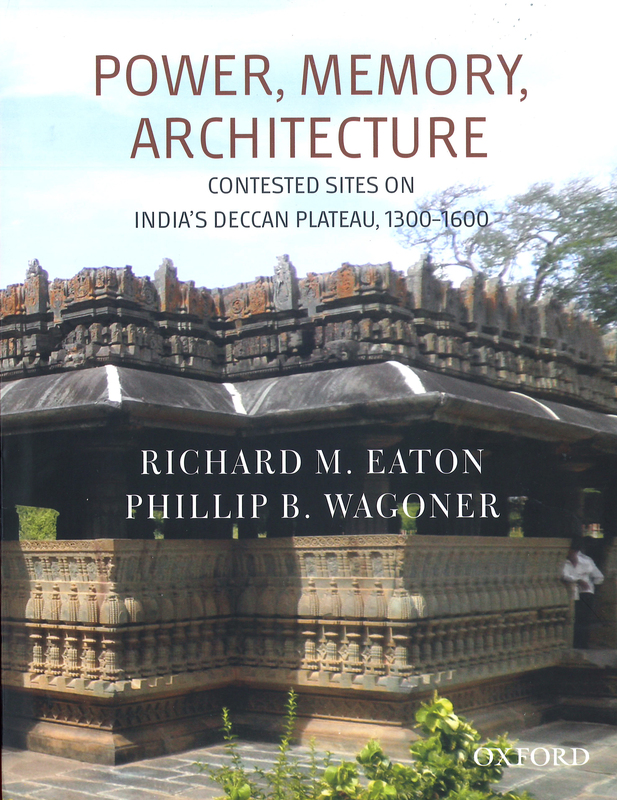 Professor Phillip Wagoner is the co-author of Power, Memory, Architecture: Contested Sites on India’s Deccan Plateau, 1300-1600, published by Oxford University Press in March 2014. 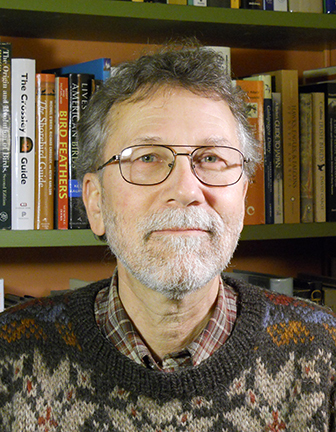 Wagoner is chair and professor of archaeology, professor of art history. Focusing on India’s Deccan Plateau, this book explores how power and memory combined to produce the region’s built landscape, as seen above all in its monumental architecture. During the turbulent 16th century, fortified frontier strongholds like Kalyana, Warangal, or Raichur were repeatedly contested by primary centers—namely, great capital cities such as Bijapur, Vijayanagara or Golconda. Examining the political histories and material culture of both primary and secondary centers, the book investigates how and why the peoples of the Deccan, in their struggles for dominance over secondary centers, promoted certain elements of their remembered past while forgetting others. The book also rethinks the usefulness of Hindu-Muslim relations as the master key for interpreting this period of South Asian history, and proposes instead a model based on parallel cultures of rulership grounded in different prestige languages, Sanskrit and Persian. Further, the authors systematically integrate the methodologies of history, art history and archaeology in their attempt to reconstruct the past, as opposed to the standard practice of using one of these methodologies to the exclusion of the others. The book thus describes and explains the interstate politics of the medieval Deccan at a more grass-roots level than hitherto attempted. 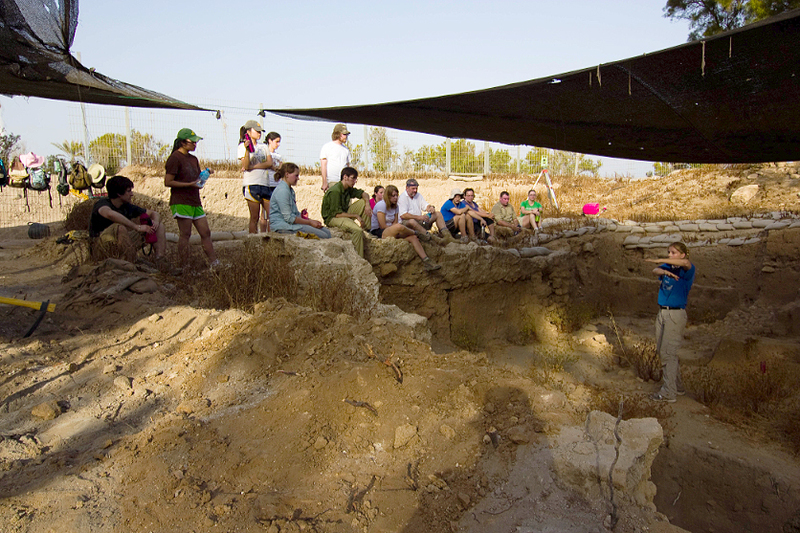 Kate Birney, assistant professor of classical studies, assistant professor of archaeology, leads a student excavation team at the site of Ashkelon. The site is located in the southern district of Israel on the Mediterranean coast. Between 2500-1200 B.C., Ashkelon was one of the largest and most important commercial centers around the Mediterranean, and it remained a thriving metropolis under varying degrees of Egyptian control until until the Crusaders conquered the city in the 12th century. Today, the site remains preserved, as does a 3,500-year-old, two-story-high mudbrick-archway. As a recipient of two fellowships, Kate Birney will have the opportunity to study the Hellenistic period (ca. 330 B.C. to ca 100 B.C.) for an upcoming book. 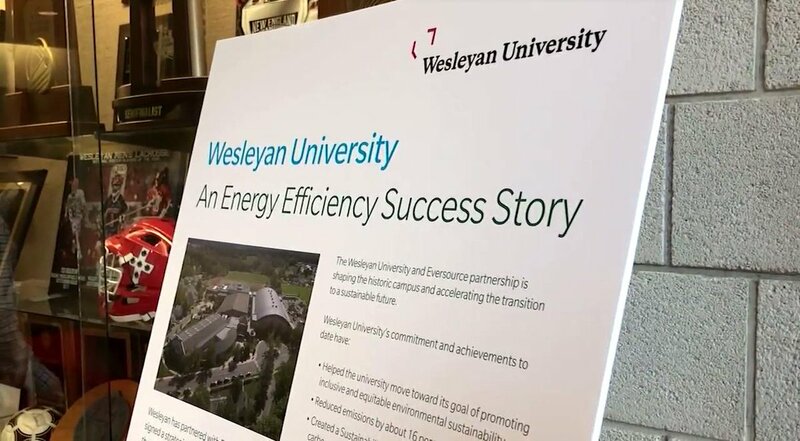 Since 1985, the site has been excivated by the Leon Levy Expedition — a joint project drawing students and faculty from Wesleyan, Harvard University, Wheaton College and Boston University. To date, Ashkelon archaeological digs have revealed a neighborhood of elite Philistine houses dating from the 11th-10th centuries B.C. Every year, Kate Birney, assistant professor of classical studies, assistant professor of archaeology, leads a student excavation team at the site of Ashkelon. And as a recipient of two fellowships from the 2014-15 academic year, she will continue her research on the historic area. Next fall, as a National Endowment for the Humanities fellow, Birney will conduct research at the Albright Institute in Jerusalem; and in the spring, she’ll complete a Fellowship at the Center for Hellenic Studies in Washington, D.C. Both fellowships are related to her present research at Wesleyan. 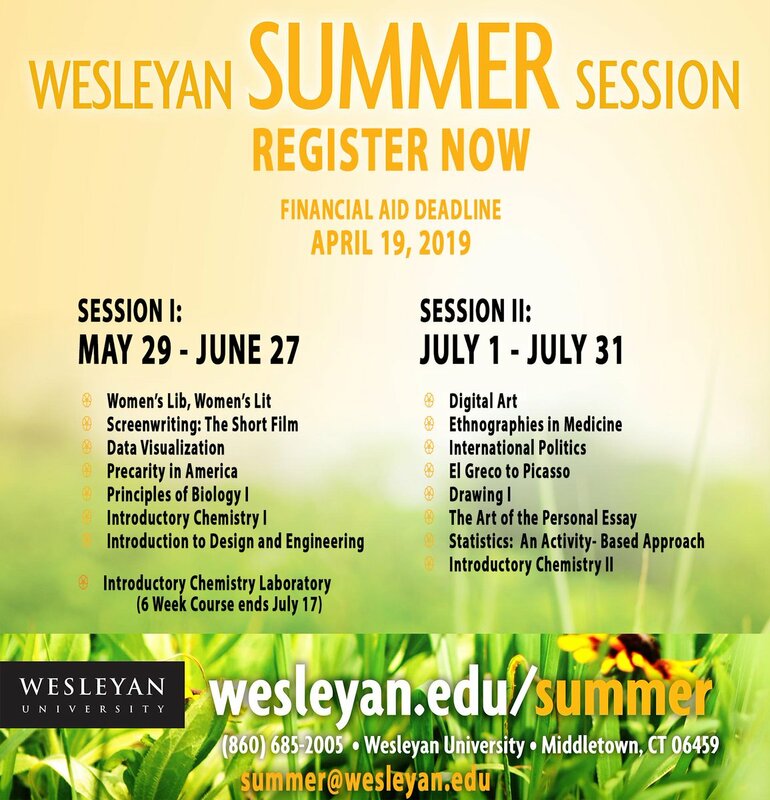 “Since I specialize in interconnections between ancient Greece and the Near East, I’m particularly excited about these fellowships. The fall NEH will allow me to work within a community of scholars who specialize in Near Eastern archaeology, to process the archaeological data, while the spring fellowship at the CHS will allow me to develop my ideas within a community of Classical scholars,” she said.